This week I’ve been at work a lot more than normal, so I’ve felt a bit squeezed for time. However, I have managed to make pretty good progress on both projects that I’m working on. I completed the main body of the cardigan, but I haven’t done any more since then. I added a bit extra to the length to make sure it’ll last for a while! It looks really curled up as I’ve still got the sleeves and button/buttonhole bands to add but I’m sure it will be fine once it’s finished and blocked. I’m not keen on the pink and shrimp next to each other but there will be a white border separating them. I’m about to attempt a new and fancy join, so we will have to see how that goes this week! What are you working on? How’s it going? Feel free to share or link to Instagram etc. The cardigan is looking lovely! I love th design around the top, it’s very pretty. Your blanket is looking great too! I can’t wait to see howit comes together. Both projects are coming along nicely! My 2 youngest have had me at the sewing machine. Must take some pics to share. Thank you, I’ll have a look, I rarely get my sewing machine out. Ooh, have fun with the fancy new border 🙂 Looking forward to seeing how it goes! The neckline on the cardigan is so pretty. 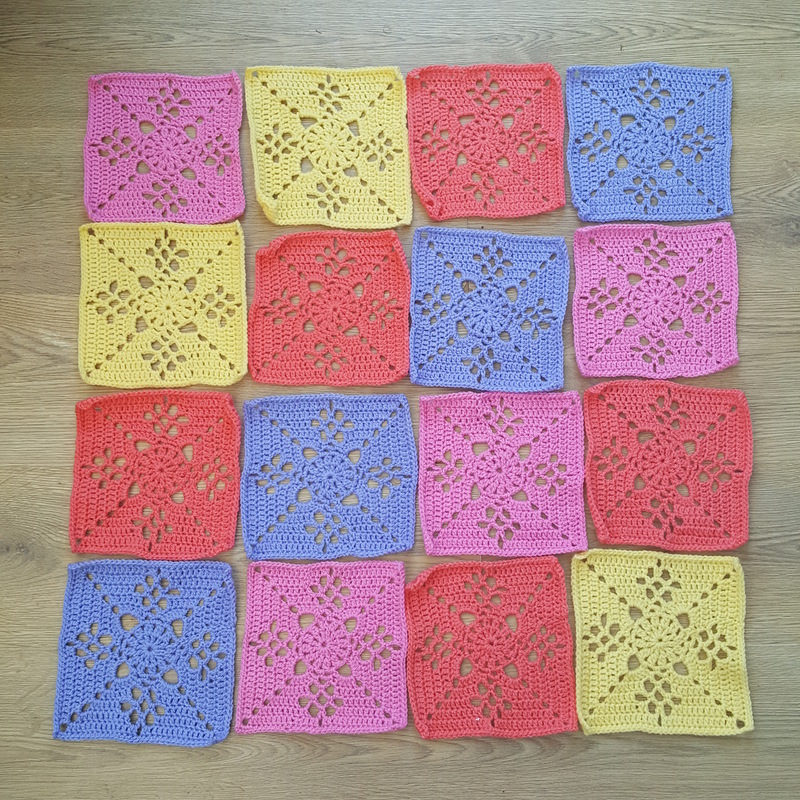 I love the lattice squares, I bet it looks lovey now you are joining them. 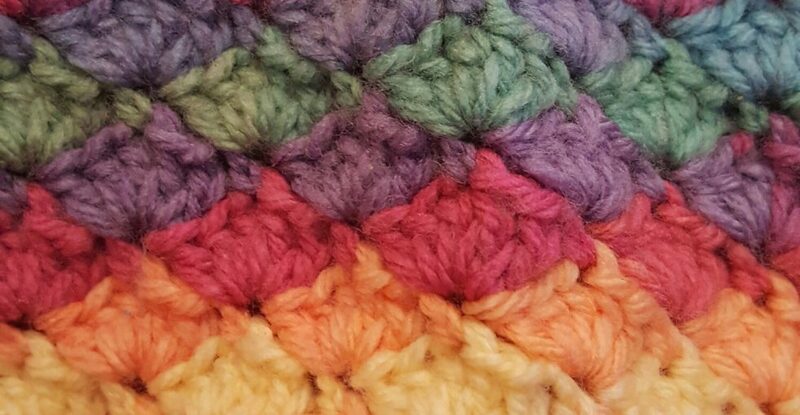 Have you used cotton yarn for the squares? Thank you, I’ve just used acrylic in an attempt at stashbusting! Lol! Thanks, I’m using the flat braid join for a nice change. LOVE the cardigan. Can’t wait to see that finished. The cardigan is looking beautiful. And the squares are just so awesome! I am looking forward to seeing your new method of joining and seeing how it all comes together. Thank you, I’m attempting the flat braid join. This is going to be such a pretty cardigan for your little one and love the nice sunny yellow shade too. Thank you, I love the colour too, it’s a lovely change from pink! Both projects are looking bautiful. I think both when finished are going to be stunning! My week coming up is going to be crazy. I am on a 6 day work week this week. Hopefully things slow down a bit for you soon! I have been working on wreaths, flower arrangements, and dream catchers this week. Beleive it or not I am considering starting some fall projects…. Thank you. Sounds like you’ve been busy, and autumn really isn’t far away! Thank you, I want it done by 2 weeks today so I can enter it into our village show! Lol, thanks, it gets very competitive so my chances of winning anything are slim! But it only sort 25p to enter so I will try.